Do you guys have a vegetable that you love but don’t eat nearly often enough?! That’s artichoke for me. I love love love artichoke and always swoon over it when passing by the fresh, green artichokes in the grocery store or at the market. But somehow, the artichoke just never seems to end up in my cart. I guess it’s because when I am dreaming up a new recipe or something quick to throw together for a meal my mind immediately goes to my regular veggies – broccoli, zucchini, mushrooms and tomatoes. But we ALL need change sometimes. 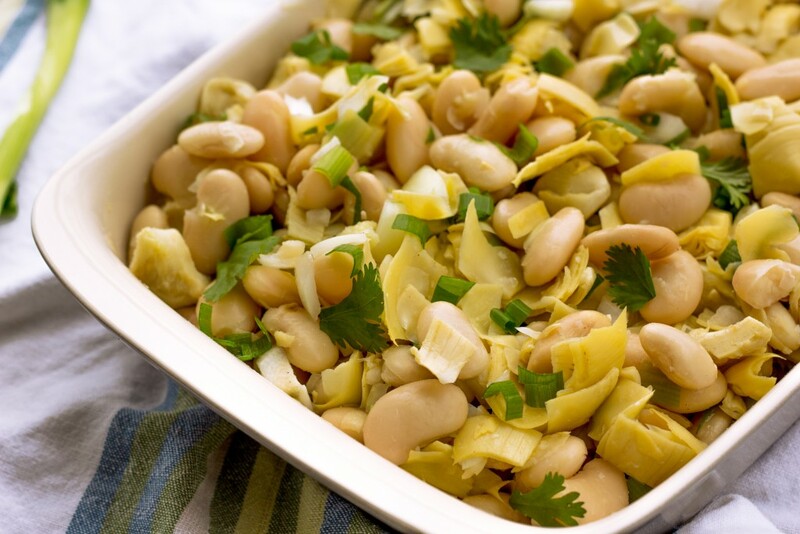 So this time, when passing by the juicy and flavorful artichoke hearts, I threw ’em in my cart along with a couple of jars of fresh, giant white beans that I’ve had my eye on for a while as well. 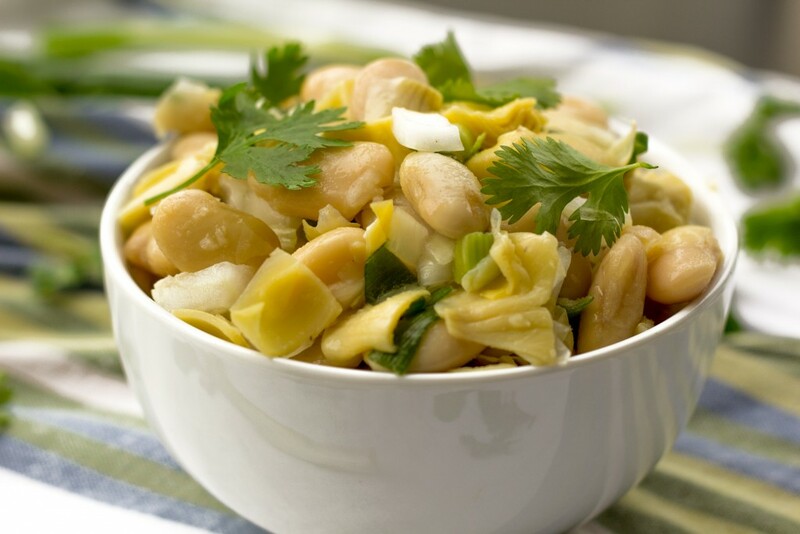 Some lemon, white onion, a few sprigs of green onion and cilantro and this simple, literally-takes-less-than-15-minutes-to-throw-together White Bean and Artichoke Salad came to be, YUM! Artichokes always remind me of French cooking y’all so I naturally tossed a lemon-dijon dressing on top! 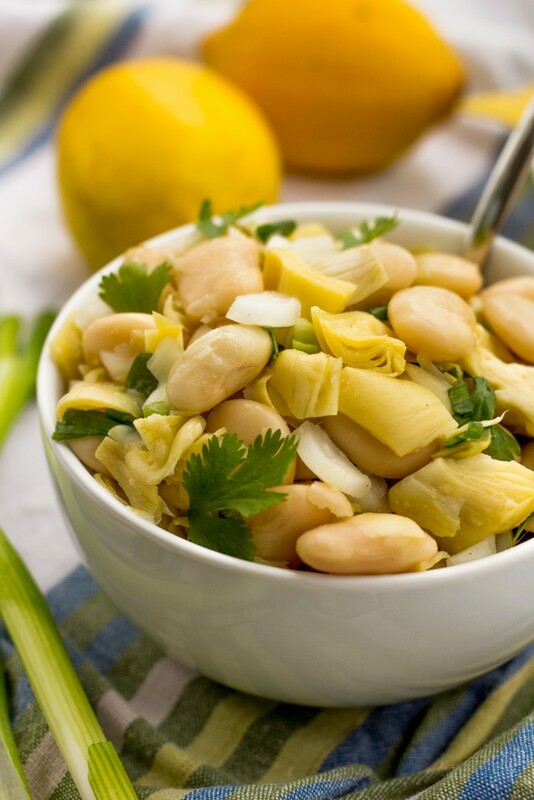 A fresh, flavorful and easy to throw together White Bean and Artichoke Salad with a light lemon dijon vinaigrette. I love to serve this salad to my family as a healthy, low fat and protein-packed side or enjoy it as a light lunch. Chop the white onions, artichoke hearts, green onion and cilantro. Mince the garlic. Add the white beans, chopped artichoke hearts, chopped white onion, minced garlic and 1/2 the chopped green onion to a large bowl. Stir together. Prepare the Lemon Djjon Vinaigrette. Add the white vinegar, fresh lemon juice, sugar, dijon mustard and sea salt to a small bowl. Stir together. Add additional lemon juice to taste. Taste. Add white black pepper to taste. Pour the dressing over the white beans and vegetables. Stir together. 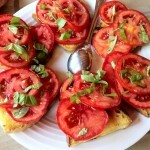 Garnish with fresh cilantro and the rest of the green onion. Enjoy! 1) I used jarred artichoke hearts in this recipe. 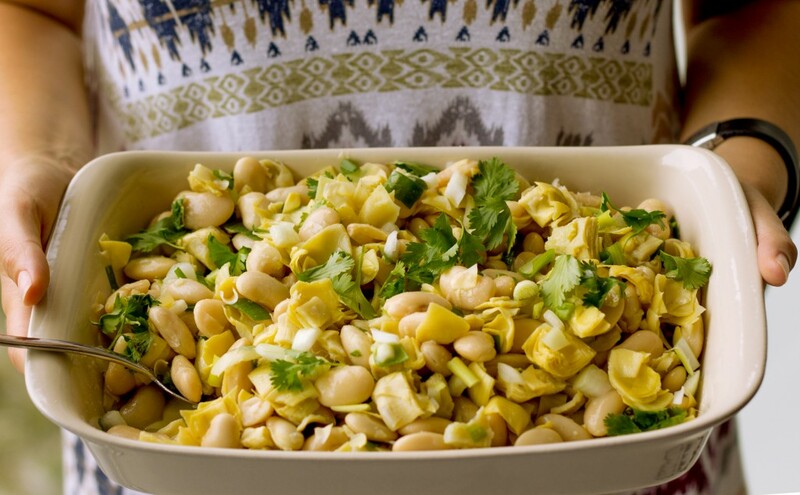 You can also use canned or freshly cooked artichoke hearts in this salad. [br]2) Add white black pepper to taste. [br]3) Tastes even better the next day once the flavors have had time to marinate. [br]4) Adjust cilantro based on taste (I like this salad with 4 sprigs of fresh cilantro). 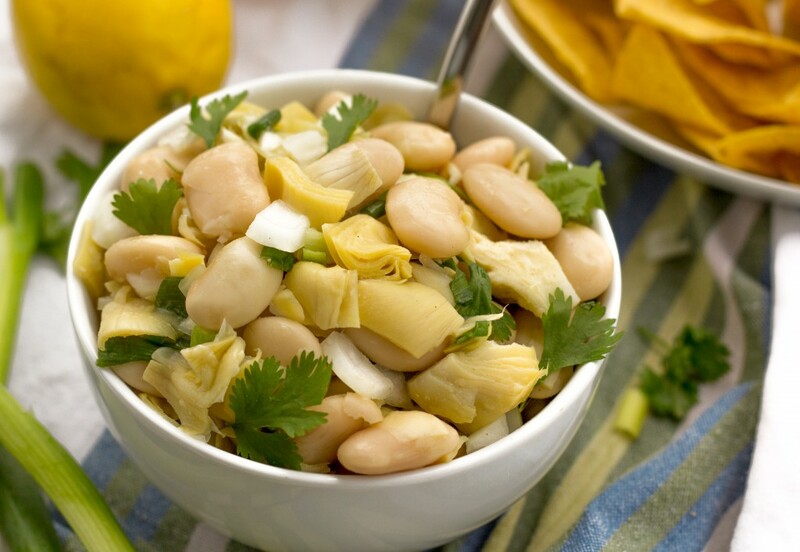 If you do make this White Bean and Artichoke Salad, I love seeing, commenting and ogling over your delicious shots and hearing your feedback! Let me know how your creations turn out by sharing your feedback in the comments below, tagging me (@cearaskitchen) in your gorgeous shots on Instagram or sharing your photo on my Ceara’s Kitchen Facebook page. Wishing you a great day everyone! Thanks Jenn. 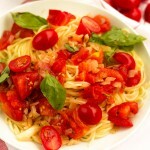 Great recipe and super easy after a day at the office. We actually eat artichoke quite a lot, but that is only because I have discovered a new love for it. It goes really well in all pasta dishes. I love, love artichokes sooo much!! I grew up eating them. My mom used to boil them whole and make a lemon garlic butter dipping sauce and we’d tear each leave off and dip it on that sauce and my favorite part was always the heart. I honestly enjoyed it as much as dessert! I’m in love with your salad and the simplicity. I bought 4 jars of Dijon mustard last month to use for dressings and I’m excited to see this one. Sounds fantastic! Another amazing recipe Ceara! Have you ever tried grilled artichokes? Soooo dang good! Same here! We almost never eat artichokes, I don’t know why, they’re delicious! This salad looks so good, and so easy to make…love it! Thank you so much, Denise!!! This is such a good idea! I love artichoke and after the leaves are stripped the heart gets divided up equally between us. Just a bite but so good. I think the combo of all your ingredients sounds delicious! This looks easy and healthy. I think I have everything but the green onion and cilantro. I always have a jar of artichoke hearts in my cabinet and seldom use them. 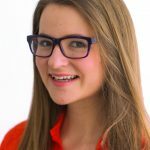 Thank you so much, Natalie! Dijon + lemon are one of my favorite combos as well 🙂 I hear you on the beets too – I love them, but don’t eat them nearly enough! LOVE this!! I, too, love artichokes and don’t eat them nearly enough. I love your suggestion of stuffing this into a pita…that sounds amazing. And your photos are just lovely!! Another winner! <3 Thank you so much, Jenn!! !